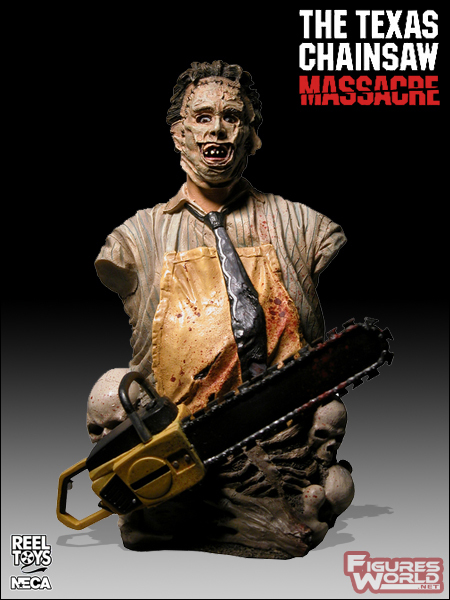 NECA presents one of the original masters of horror, Leatherface, in this new mini bust. The Leatherface mini bust stands approximately 8 inches tall and is made of resin. In 1974, Tobe Hooper created one of the most disturbing and gritty horror films of all time: The Texas Chainsaw Massacre. For over 30 years the film, its three sequels, and a blockbuster remake have been terrifying audiences for years. When a group of kids encounter a psychotic hitchhiker while traveling through Texas, they find themselves marked by slaughter by the diabolical and cannibalistic Sawyer family, featuring the iconic and terrifying Leatherface, a chainsaw-weilding maniac with a mask of human skin. When face to face with such madness, who will survive, and what will be left of them?